Summer is here, and so is vacation season. I know, as a small business owner, it’s important to write off as many expenses as possible to minimize that tax bill, and this includes travel. Well these things are not 100% true. The worst part about these falsehoods is that some recruiters in major MLM companies will tell you these things as a selling point to get you to sign up. The primary purpose of your trip MUST BE BUSINESS. You need to have your business meetings planned before you leave for your trip. You can’t just fly willy-nilly to a place and hope you will find a meeting. For travel to be deductible, the meeting or conference must be scheduled before you get on that plane, train, bus, or automobile. And you may write off YOUR portion of that family vacation, but it depends on some pertinent facts. Any other “ordinary and necessary” expenses – including but not limited to baggage fees, dry cleaning while away, business center costs, etc. Make sure you get a receipt. Next are the days and places of travel. You will want to document your flight information if you are traveling by air, your mileage if you are driving, train or bus information if you are going by ground, and your cruise information if you are traveling by sea. This includes the dates and times of your round trip travel and any connections. These travel days will come into play when calculating if the trip is deductible, so don’t skip this step. There are also different rules for writing off domestic, international, and cruise travel, which is why this information is necessary. The convention, seminar, or meeting is directly related to your trade or business. The cruise ship is a vessel registered in the United States. All the cruise ship’s ports of call are in the United States or in possession of the United States. You attach to your return a written statement signed by you that includes information about the total days of the trip (not including the days of transportation to and from the cruise ship port), the number of hours each day you devoted to scheduled business activities, and a program of the scheduled business activities of the meeting. You attach to your return a written statement signed by an officer of the organization or group sponsoring the meeting that includes a schedule of the business activities of each day of the meeting, and the number of hours you attended the scheduled business activities. Round trip international travel must be prorated by the number of days on business to the total number of days of travel. Travel days, the days required for business (conference days or meeting with clients), and certain weekends and holidays count as business days. However, if the majority of the time spent on your international trip is primarily for personal reasons, absolutely NONE of the travel expenses are deductible, but the direct expenses for business can be written off, including expenses such as conference registration fees. Oh, and travel abroad must be 1 week or less or the deduction is limited even more. Confusing? Don’t worry. I’ll share examples later to make this easier to understand. Who traveled is an easy one. You simply must document who was on the trip and if you paid their travel expenses. Want to bring your spouse or children? Cool. Are any of these family members affiliated with your business as an employee or partner? No. Sorry, no round-trip transportation deduction for them. 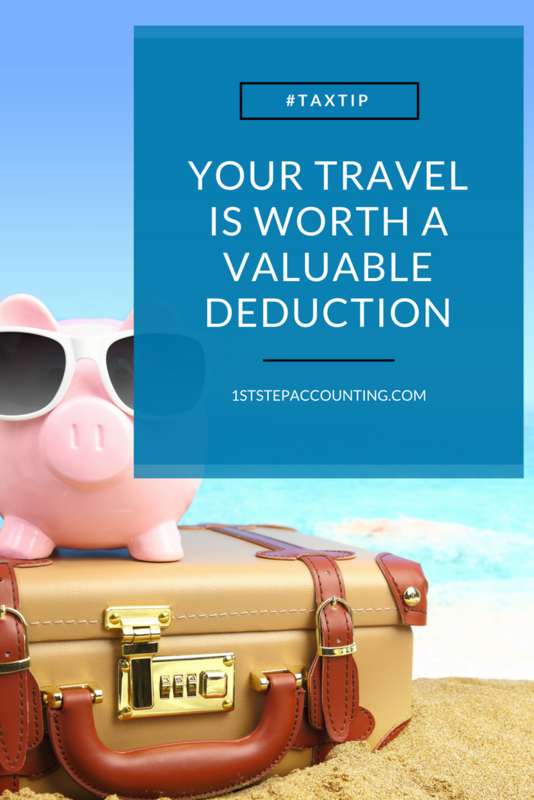 However, if the answer is yes and they are contributing to the meeting or learning to help grow your business, the travel expenses can be deductible. You definitely want to have proof that your spouse or children is working for you, so don’t just try to make up a story to get a write-off. Plus, there are benefits to hiring your children; you can read about them here. Last, you need to have documentation why you are traveling. If you are attending a conference, keep your registration or handout documents as proof of the dates and times of your conference (this comes in handy if you are ever audited and need to prove you were attending a conference). If you are visiting clients, document in your calendar who you meet with and why. You don’t have to meet with an existing client to be eligible for the write-off; you can also meet with potential clients, wooing them for their business. But don’t forget you need to have these meetings scheduled BEFORE you leave for your trip. John’s trip is deductible because he is away on business for 5 days (2 travel and 3 business days) and the trip is in the USA. Remember, meals are limited to a 50% deduction. Daisy’s trip must be prorated because 2 of her days in Italy was for sightseeing and not for business. The airfare is 100% deductible because over 75% of her trip was spent on business. Meals are a 50% deduction for the days spent on business (Monday – Friday). Because Kelly’s presence was required on Friday and Monday, they are business days. Because the weekend is between business days, Saturday and Sunday are counted as business days. This is true even though she used the weekend for sightseeing, visiting friends, and other nonbusiness activity. 6 days in Florida are considered business days (Thursday-Tuesday) for Charles. His family has no ties to his business, so a deduction is not allowed for them, but he can write off his roundtrip travel, because the trip was primarily for business. Now that you are a little more familiar with traveling for business, I want to know where you are visiting next. Let me know in the comments below. I love your clear examples and especially how smart Kelly was in her travel plans! 😉 My next trip will be to Idaho like John for my annual planning retreat, then Vegas in January for a company retreat with clients. I know you’ll keep me on track with my write offs!! Kelly you crack me up ?? Im glad you like the examples. This topic can sometimes be hard to understand so I try my best to make it clear for clients like you to get the benefit of the write-off! 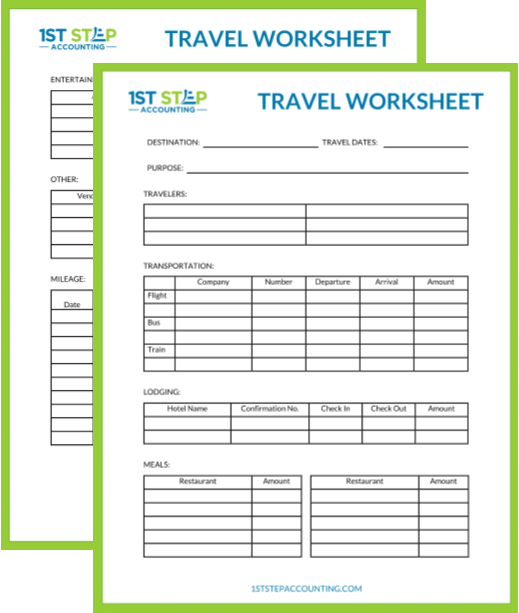 Are you sure you don't want those Travel Worksheets? Get this free download delivered right to your email inbox just enter your information above. Enter your Name and Email Address below to ﻿get the worksheet delivered to your inbox!